We have created a spreadsheet of most of the permits on record for Capitol Hlll from 1877 to 1945. It is available as a PDF. The PDF document is 218 pages, landscape, sorted by Square Number. There is line for each square with information across two pages. The square number is repeated on the second page for clarity. You should be able to print the individual pages. The PDFs files accessible on this page contain summary of many of the building permits issued to construct buildings during this time period, listed by Square. This project has been funded in part by a U.S. Department of the Interior, National Park Service Historic Preservation Fund grant administered by the District of Columbia’s Historic Preservation Office. Note: Address and/or lot numbers may be different now than when the permit was issued. To find your current lot and square, look on your DC property tax bill, or go to the DC Taxpayer Service Center web site (www.taxpayerservicecenter.com/) and enter your street address. 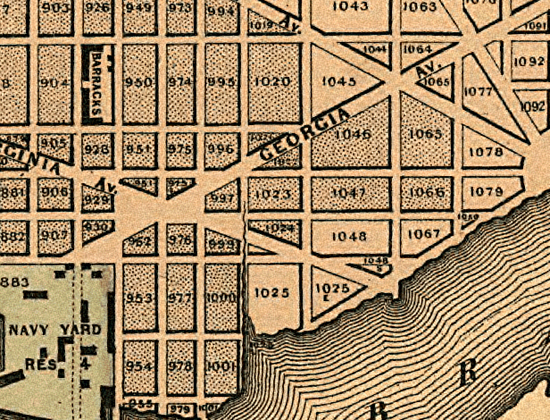 The approximate area covered by Squares 1000–1125 is highlighted on the 1857 map above (Library of Congress). 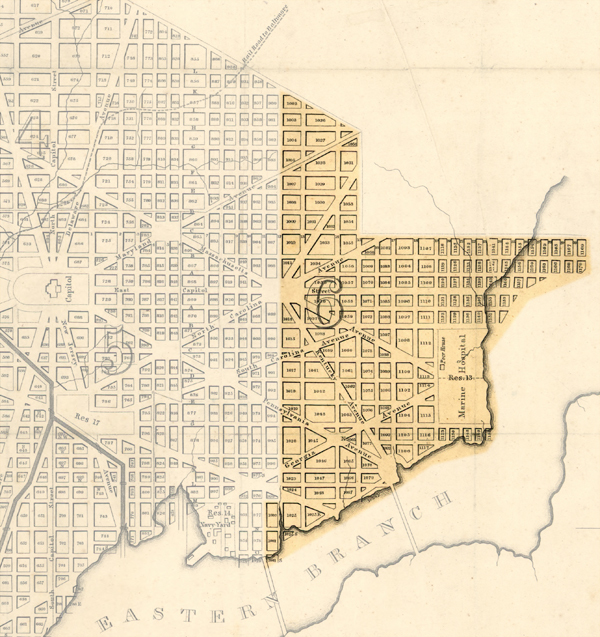 It’s roughly bounded by the Anacostia river on the south and east, 12th Street on the west, and Florida Avenue and C Street on the North. Table below reads left to right. Click on a Square range to open a PDF file in a new window. You can also download a single PDF containing all of the Squares listed above.Click here to download the PDF containing Squares 1000-1125. Note: This file is 2.5MB. If you are connected to the internet with a dial-up modem it may take a long time to download the file. We now have a new, more complete list that includes 758-1082, but it is only available in the Excel Version at this time, Click Here CH House Permits – Excel. Note: the Dates are truncated (missing the final digit of the year) for dates with more than 5 digits. Contact the Webmaster at CHRS420@gmail.com if you have problems.